A lifelong resident of the Aurora area, Nancy Smith Hopp pursued her education at Aurora University, and earned a B.A. in Social Sciences in 1968 and an M.S. in Business Management in 1982. Nancy enjoyed a long career in marketing communications in the fields of health care, education, and not-for-profits before retiring in 2007. She has been an active community volunteer for more than 40 years, currently serving on the board of the Fox Valley Arts Hall of Fame, and is the recipient of several local and national honors for her contributions and accomplishments. Nancy's book, WARM LIGHT, COOL SHADOW: THE LIFE AND ART OF RUTH VAN SICKLE FORD, was a 7-year project, which she self-published. The 177-page hardcover book, designed by award-winning artist and author Wendell Minor, is an affectionate in-depth look at the life and art of one of the Midwest's best watercolorists. Illustrated with 75 color images of Ford's paintings and 30 candid photos, the narrative is part biography, part diary, part lesson, and part tribute. 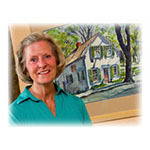 Nancy and her husband, Jim, live in her childhood home with 2 special cats. She and her family enjoy water sports, cultural arts, auto racing, and the great outdoors. Her experience covers the full range of publications, including more than 40 "growing up" stories for her 5 grandchildren. WARM LIGHT, COOL SHADOWS is her first full-length book. She accepts free-lance writing assignments, gives talks to both youth and adults, and consults with small businesses and organizations on marketing strategy and communications. She is currently compiling a collection of invocations.